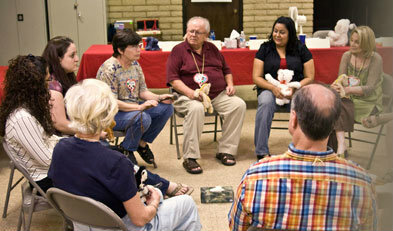 Grief Healing: Grief Support Groups: What Are the Benefits? A knowledge that another has felt as we have felt, and seen things not much otherwise than we have seen them, will continue to the end to be one of life’s choicest blessings. A reader writes: Today is exactly two months since my husband died. I have been crying since Sunday, after my son and his fiancé left. I can't seem to find any joy in anything. Two of our children are getting married, I have a new grandchild on the way, there is so much happy stuff going on, and I just want to cry. Maybe I’ve been trying to be brave. Nobody likes a downer, but damn it, I feel like a downer. I just saw an ad in the newspaper for a grief group that’s starting this month, and I really feel I need this. I have never been one to join a group, but this is more then I can deal with. Do these groups really help? There are six sessions, all dealing with different steps. Is it worth trying? Any advice would be welcome. Thank you. My response: If you visit our online Grief Discussion Groups website and type the words "support group" into our site's search engine, you will be led to dozens of posts on this very topic, which is a good indicator of how many differing opinions you will find. As others accurately point out, whether a support group would be helpful to you depends on many different factors, including your own needs and expectations, the purpose and composition of the group, and the skills of the group facilitator. It has been my experience as a grief counselor that the most effective grief work is not done alone, and whether we connect with others in person or online, I believe that support groups are invaluable. When we’ve lost a loved one, we usually feel a need to connect with others who understand what grief is, who’ve suffered a similar loss, and who know what our sorrow feels like. At a time when it may be difficult for us to feel comfortable in the usual social settings, support groups give us a safe place to interact with others. Here we can express feelings without fear of being judged, and ask questions and get responses from others whose experiences may be similar to our own. These others listen willingly, and they share their stories of loss with us also. No one knows the pain of loss as well as someone else who is experiencing it, too. It’s also very reassuring to learn that what we are going through is normal. Working our way through grief is some of the hardest work we will ever have to do, but realizing that we don’t have to do it all by ourselves can be life-affirming. One of the saddest realities about losing a loved one, whether that is a person or a cherished animal companion, is that friends and family members tend to be finished with our grief long before we are done with our own need to talk about it. That’s why it’s so important that we find understanding, non-judgmental listeners with whom we can openly acknowledge our reactions and experiences, express and work through our pain, and come to terms with what has happened to us. Another benefit is that by sharing our loss and pain, we help one another. Eventually we find ourselves on the giving end of this compassion, reaching out through our own woundedness to the newly bereaved, helping them along, listening to them and offering them the hope that, just as we have survived our own losses, they will survive theirs also. Together, stumbling along the way and reaching out for help, pausing to offer comfort and walking on together, we can complete our journey. In the process, we learn to love and to be loved much more fully. It is one of the great lessons of loss. To find a grief support group in your area, contact your local hospice, hospital or funeral home. If you live in the Valley of the Sun / Phoenix metropolitan area, see Hospice of the Valley Grief Support Groups to find a support group near you. And if you're looking for online support, know that you are always most welcome to join our online Grief Discussion Groups. Grief Support Group Didn't Help -- Now What?